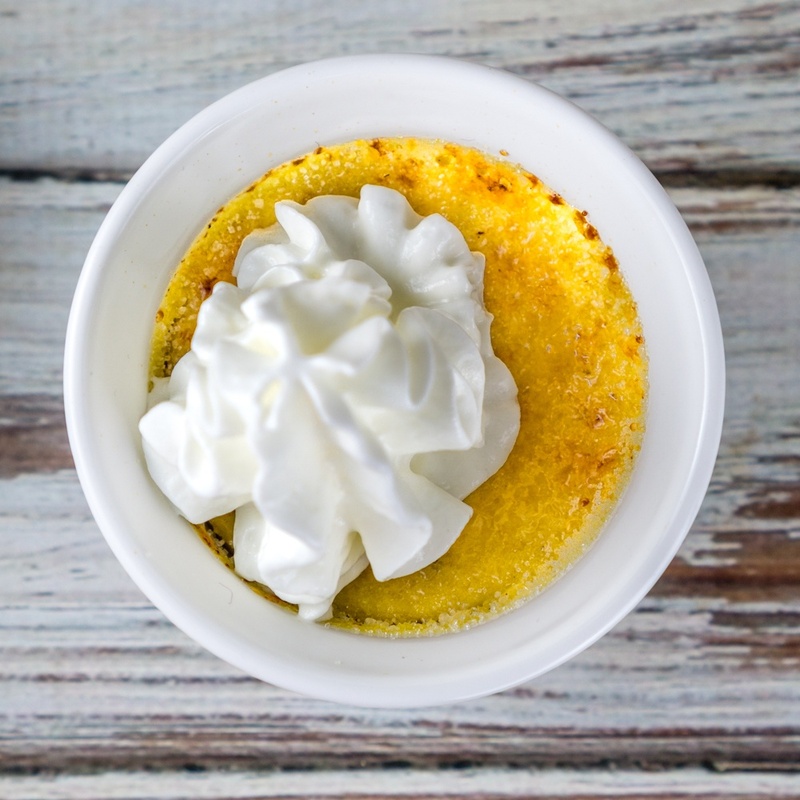 Eggnog Creme Brulee is the perfect dessert for the holiday season! This 3-ingredient recipe is extremely easy and delicious. In a 2-quart saucepan, gently heat the eggnog until it is almost starting to simmer, stirring every few minutes. In a stand-up mixer, beat the egg yolks while the eggnog is heating. When the eggnog is heated, slowly add it to the egg yolks while keeping the mixer on. Transfer the mixture to your baking dish. If making individual servings, add 1/2 cup of the mixture to each ramekin. If making casserole-style Eggnog Creme Brulee, carefully pour the eggnog mixture into a ~1.5 qt oven-safe dish. Place the baking dishes into a secondary container filled halfway with water, and place the container into the oven. Bake at 300F for 40-45 minutes if making individual ramekins, or for about 1 hour and 30-45 minutes if making casserole-style creme brulee. The creme brulee should be set around the edges but still jiggle in the center - it will set as it cools. Carefully remove from oven and allow to cool. Refrigerate for at least 4 hours or overnight. Before serving, coat the top with an even layer of sugar. Use a culinary torch to caramelize the sugar on top. Serve with a big dollop of Reddi-wip whipped cream.